It was his first ever alligator hunt, but lawyer Levi McCathern made sure his name will go into the record books. With a single shot he killed what is believed to be one of the biggest ever alligators ever found in the America – a monster weighing almost 900lbs and 14 feet long. 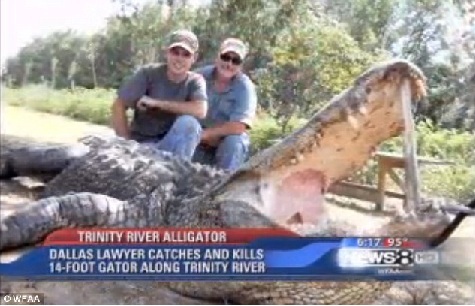 He applied for special permission to hunt the gator on private land and it took him and his guide two days to stalk the giant reptile in the Trinity River, near Crockett in east Texas. He killed the beast with a single shot to the brain from a distance of 100 yards, and admits it was his finest ever kill. ‘It went right in the brain… it was a perfect shot, probably my luckiest shot,’ said Mr McCathern. The Dallas-based lawyer said he plans to have the gator mounted and placed on a wall in his office where other hunting trophies adorn the walls. He said he enjoyed hunting, but usually tackled smaller prey, such as deer and elk as well as dove and quail. McCathern said he searched on the internet for the best place to find ‘monster gators’ and came up with the Trinity River. He said he got his shot when the monster popped his head up out of the water. ‘This was my first alligator hunt. It was the thrill of my hunting career. I’m still smiling,’ he said. McCathern said he got special permission to hunt the gator on private land as it had been attacking a local rancher’s cattle. So it really was a monster, complete with attacks on cattle like some horror movie on the SYFY channel. The English commenters are of course feeling sorry for this “defenseless animal” killed by a “trigger happy yank” but they don’t have dinosaurs roaming their ponds. This entry was posted in Dangerous Game, Hunting, Predators. Bookmark the permalink.